My Ántonia tells the stories of several immigrant families who move out to rural Nebraska to start new lives in America, with a particular focus on a Bohemian family, the Shimerdas, whose eldest daughter is named Ántonia. The book’s narrator, Jim Burden, arrives in the fictional town of Black Hawk, Nebraska, on the same train as the Shimerdas, as he goes to live with his grandparents after his parents have died. 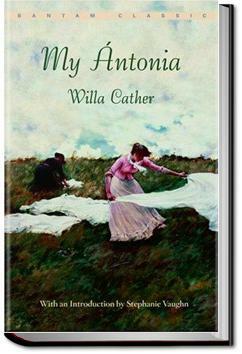 Jim develops strong feelings for Ántonia, something between a crush and a filial bond, and the reader views Ántonia’s life, including its attendant struggles and triumphs, through that lens. . . .The basement kitchen seemed heavenly safe and warm in those days—like a tight little boat in a winter sea. The men were out in the fields all day, husking corn, and when they came in at noon, with long caps pulled down over their ears and their feet in red-lined overshoes, I used to think they were like Arctic explorers. i read this book the same day i found out that sparkling ice had introduced two new flavors, pineapple coconut and lemonade. what does this have to do with anything, you ask?? Here lie glorious character sketches. Be sure to pay your respects. I dragged my feet. I came late to the party. I regret it.